The Town of Hugo is now without a Chief Marshal after Joy Hemby tendered her resignation last week. Hemby’s resignation apparently came as a surprise to many in town government. A special meeting had to be called last Wednesday, Sept. 17 to officially accept her resignation. Mayor Pro Tem Dave Dobbs chaired the meeting in the absence of Mayor Patsie Smith who was away on vacation. Hemby was not present at last week’s special meeting. Her resignation came in the form of a letter that stated she was tendering her resignation as Chief Marshal effective Monday, Sept. 15. No explanation for her decision was given. According to Town Clerk Maria Nestor who was present at Wednesday’s meeting, the board’s six trustees voted unanimously to accept Hemby’s resignation. Hemby’s resignation has left the Hugo Marshal’s Office without any officers. The Deputy Marshal’s position in the two-officer department became vacant last winter and has not yet been filled. After accepting Hemby’s resignation at Wednesday’s special meeting, Nestor said the board held a brief discussion on whether or not to continue the Hugo Marshal’s Office. In the end, the trustees decided it is essential for the town to continue its own law enforcement office. In one other decision, the board also agreed to hold a Public Safety Committee meeting on Wednesday, Sept. 24 at 6:30 p.m. to discuss the application process for filling the Chief Marshal’s position. Last week’s surprise resignation ended Hemby’s 2-1/2 years of service to the Town of Hugo. She was sworn in as Chief Marshal on April 2, 2012. Prior to coming to Hugo, Hemby had served as a police officer for about 16 years as well as an additional 10 years as an investigator. Hemby first became a full-time police officer with the Greeley Police Department in 1986. 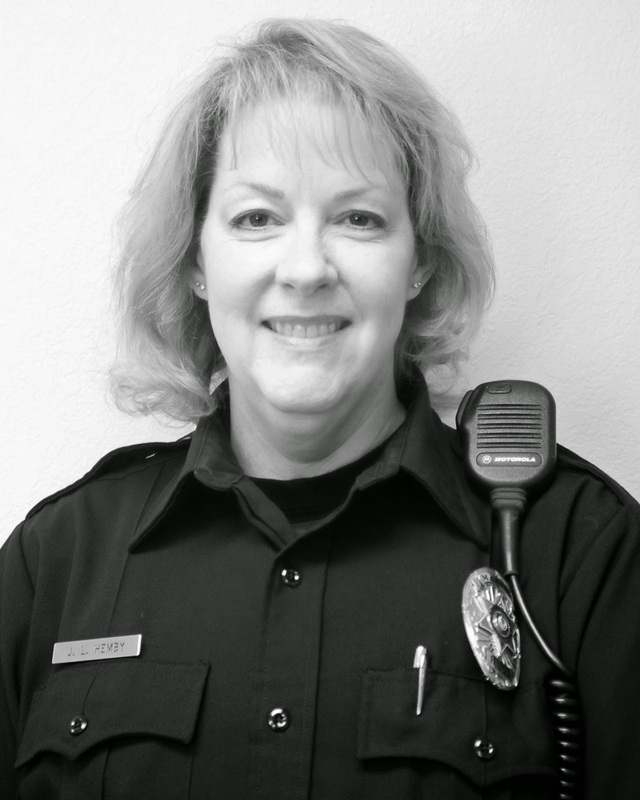 The following year, she was selected to attend the law enforcement motorcycle school in Grand Junction where she became the first female motorcycle officer in the state of Colorado. Returning to the Greeley Police Department, she served as a motorcycle officer for four years. Returning to the department’s patrol division in 1991, she worked as a patrol officer for six years. Then in 1997 when she was promoted to detective and worked in that position for five years. In 2002, Hemby retired from the Greeley Police Department. After working a year as a private investigator in Wisconsin, she returned to Colorado to accept an investigator’s position first with the Douglas County Coroner’s Office and later with the District Attorney’s Office of the 18th Judicial District. During her work with the DA’s office, Hemby worked several cases in Lincoln County and became familiar with the local area. When the opening for Hugo Chief Marshal’s position was advertised in early 2012, she applied and was chosen. During her tenure as the town’s top law enforcement officer, Hemby led the reorganization of the Marshal’s Office. She was also involved in enforcing the new nuisance and derelict building ordinances approved by the board. In addition, a Hugo Marshal’s Office investigation led by her resulted in an arrest of a suspect in Genoa on felony drug and weapons possession charges last May. In recent months, a couple of complaint letters and some verbal complaints about the Marshal’s Office were discussed by the board in its monthly meetings and reviewed by the board’s Public Safety Committee. Also, the continued lack of a Hugo deputy marshal created some friction with Lincoln County Sheriff’s Office that has had to send its deputies to handle law enforcement incidents inside the town.